As I write this, several dozen Residents are encamped outside the entrance of the Linden Estate Services office, most waving protest signs, some engulfed in flames. It's part of a larger backlash against last night's announcement that the Lindens will significantly increase the land use fees of "Openspace" regions (or in Resident vernacular, void sim), from USD$75 to USD$125 a month, starting next January. Designated by the Lindens for "light use", Openspace regions, as the name suggests, were intended to emphasize open landscapes and water bodies, with little or no homes or other objects. Instead, land manager Jack Linden claims, these regions "are being used about twice as much as we expected." Hence the price increase. To give this a real world analogy, imagine that the Lindens were the US government, and they sold off large portions of Federal parkland to citizens at bargain prices, with the understanding that the private landowners would preserve their estate in more or less the condition they bought it. In response, there's an unexpected demand for this land, while many existing owners begin converting much of their pristine land to real estate. So the government suddenly increases the cost of new parcels, while greatly raising the property taxes on previously purchased regions. If that happened, Washington D.C. would probably be overrun by protesters, too. Especially if it happened now, during the height of global economic uncertainty and recession. "Many of us will be out of business, or have to change openspaces back to normal estates, because the difference in tier is going to be very large... Anyone working for LL should realize that their paycheck is blood money, squeezed from small people who wanted to make money here by creating and selling. It is time for me to go. I will convert this blog into my creative writing blog." "Linden Lab has destroyed credibility with its latest surprise announcement to 'jack-up' the prices on more than 50% of the grid's monthly fees... Linden Lab has been touting its land 'growth' for the last 5 months since Mark Kingdon joined as CEO. I called it a misleading charade when in fact the growth was a conversion of full to void sims--actually lowering the number of prims on the grid. I called it a bubble. But never ever, did I imagine that Linden was pulling a bait and switch move on the entire land market." "Linden Lab is within its rights to make this price increase, no matter how much it riles people. But wouldn’t a better approach be to use the metrics they must be collecting to track down the violators and boot back all/part of the prims on those lands?" 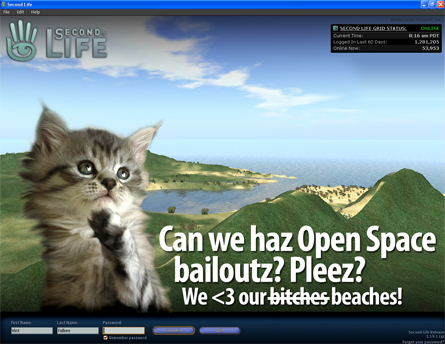 LOLcat Openspace protest by Vint Falken, found on Crap Mariner's Openspace Flickr stream, created, he explained to me, to show the void/Openspace sims threaten by this coming price increase. "Today, we are faced with a very different economy and a multitude of entertainment choices. We're also in the midst of an economic downturn that may take us a decade of hard work to fight our way out of. Linden Lab would do well to remember that... The consequences of this action are more than a little dire-- not for Second Life as a whole, but particularly for sims that rely heavily on open spaces for not just an aesthetic, but their day to day activities. Sims like the Second Life Sailing Confederation, or the Wild West sims, or Caledon, or Antiquity, all of which have significant open sims that being used as an essential aesthetic for community activities.. the draw, if you will." "Reacting in a knee-jerk 'SCREW SL!' way isn't the answer right now. Be angry, fine and yes, but as we have seen in the past, our being ticked off at something they've done (gambling ban, SL5B, trademarks, land devaluation) hasn't made a damn difference, now has it? ... The way I figure it, in the end we hate these kind of policies, but we really do like being here despite it all. Oh, my Las Olas home is a rental on an openspace sim. Am I screwed? Yup, probably, maybe." "I believe Linden Lab have really dropped the ball on this one, and what was already a fragile Second Life economy will suffer even more now. More designers will drop out of selling their wares in Second Life, land barons will get fed up and leave and we will generally see spending by residents drop as a result of the increase." 3. throttle performance on open space sims (hard limits to number of avatars and script time)"
"The whole RL world is currently in the throes of a financial downturn (how deep or long, it’s anyone’s guess at this point), and despite indications to the contrary, the SL world is not immune from RL’s effects... Much as I hate to see anyone screwed over by LL, the fact remains, if they go down, all of SL goes down with them, and we’re all screwed. And maybe that poisons the dream of a 'real' Metaverse for years, or decades." "Everyone knew that OpenSpace sims were being used for all sorts of things apart from Sailing and Occasional Walks In The Park. The Forums were full of advertisements for them as residential, and in fact, complaints were regularly raised that OpenSpace areas were being passed off as full-fat Sims in sales - because on first glance they appear fine, and even on subsequent glances, and in fact they are fine in a lot of cases where certain types of scripting or high occupancy are not involved. Please - the idea that this is an issue that has suddenly appeared out of nowhere is not credible." "Openspace sims being used for homeowners, and stores is a bad thing; it hurts those whom rent regular sims and those on the mainland. The rise in Openspace sims creates less of a push for mainland and regular sim rentals forcing business people to change their business model for cheaper Openspace spaces or forcing people out of the rental market because they are unable to compete." "I know many of you are exhausted, angry and disheartened. As recent events have demonstrated again, and given that many of you feel that we have come to depend on Linden Lab to act unreasonably, I want to encourage you to begin developing an intelligent exit strategy, but please don't forget to stay in touch with the contacts you have carefully forged over the years. We want to stay in touch with you." OpenSpace Sim Prices SHOULD NOT Be Going Up! VOTE To Stop This ridiculous increase! "As a resident since 2005 I feel like it is my duty, and the duty of all residents who agree with me on this, to vote and protest this!" Much thanks to NWN cub reporter Patchouli Woollahra for alerting and teleporting me to the heart of the protest! "Here's all this cheap land which actually has no restrictions on it for use except for us politely asking you not to overuse it." "Whoa! People are overusing it since we didn't put any restrictions on it whatsoever and made it incredibly affordable?! I had absolutely no idea this could happen! Well, let's jack all their prices up instead of implementing usage restrictions, because that would take some, y'know, programming effort." Comedy like this writes itself. This whole thing could've been avoided if the Lindens realized that they were handing out too much for too little in the first place. 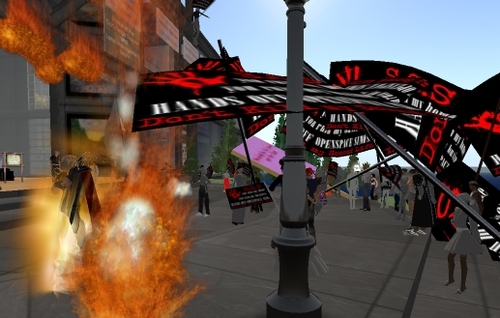 The Second Life - Openspace/Void Sims Flickr group was created in response as a peaceful protest to show what might be lost if this change goes ahead as planned. In the group discussion you will find links to numerous blogs on the issue, along with other relevant links and resources. People certainly feel passionate about the issue within hours of it's creation the group had over 80 members and over 120 images and it continues to grow as more residents wake up, wipe the sleep from their eyes and hear the news. All those communities who did use it as intended will be punished and possibly destroyed. Sims with a vehicular component (Sailing, flying and driving) rely on voids for their special activities. Take those away and they no longer have appeal will fall by the wayside. Some no doubt will go under. I wonder if there's some way for them to query the system to find out useage stats to see WHO is misusing the openspace sims, and then contact those people, rather than applying a broad brush to everyone? I'm sure they know who has openspace sims, so why not make a visit over time to each of them to make sure they're complying? For those whom were using openspace sims as homes, etc, that was not the intended use for these sims to begin with. It's not like they hid these facts from anyone, it was out there in the open for all to see. As often, the good suffer from the bad. It was clear that these sims were not intended for residential areas, shops etcetera; no one would have to be really surprised that the Lindens do something to interfere, here. But the way Linden Labs have handled this, is definitely not smart. Up front, they assumed anyone would abide by the guidelines as published, which was idealistic maybe, but terribly naive. And now they correct the situation with a blunt axe! This should have been thought out better beforehand. The ones I feel really sorry for, are those who did use the openspace sims the way it was intended to. They are harshly punished for other people's behaviour, here. Not sure your parkland analogy holds water but still...there's a solution to the problem: add a surcharge for high bandwidth usage on OpenSpaces. OS sims have already a prim limit set on them, so that can't be the problem - perhaps they could add an active script limit too (if there isn't already one) to prevent one heavily-scripted sim dragging its server-neighbours down. Beyond that Linden's main issue must be the bandwidth the over-used OS's are generating - so either put a limit in place or preferably add an automatic surcharge. If your OS sim uses more than the monthly limit of bandwidth then you start paying extra for it - on a sliding scale up to the US$295 level a full sim would cost you. That way modest users could still enjoy the value of an OS sim but the people hammering them will have to pay their way or move to a full-spec sim and be done with it? @Eris--but isn't the void issue then just the same as the full sim issue? So does this mean LL will "jack-up" prices on full sims also? The CTP (yes, I made that up = cost per thousand prims) on a full sim is half of the new void CTP. So if I move 4 voids onto one full--then I just moved the same problem within the same network. Looks to me like a full techincal meltdown at LL as the design flaws are breaking the service finally. Isn't really the biggest problem that LL has 2 flawed design concepts-- 1) all inventory available all the time to all people for free 2) avatars can wear and collide with as much stuff as they want for free. So there is no economic disincentive to manage activities on the grid. I mean--why not ban bots and campers? How much impact on severs are real people vs npcs? Jack Linden is just makin stuff up as he goes along it seems--and now LL is letting him dangle. Linden Lab should perhaps take another look at their PR department. Who the heck let this decision leave the desk with full approval? I was just brought to tears watching the photostream at http://www.flickr.com/groups/openspacevoid/ The thought of so much beauty and creativity being lost is heartbreaking. And on a personal note, the future of my own openspace is up in the air, months of dreaming and work perhaps only to fade away. Hamlet, thanks for your bold stand on this. The survey is a great idea too. People that think LL cares are deluded. LL appears to be run by Rivers Run Red now. There won't be any resident created content allowed in SL within a year and all stores will be RRR stores. There will no longer be private islands and all land will have to be bought from RRR. You watch. Aptly named that Rivers Run Red company. If you think this is bad, wait until Linden Labs announces the new rustproofing fee. Linden Labs, how about a 'pay per prim' system? "LL appears to be run by Rivers Run Red now. There won't be any resident created content allowed in SL within a year and all stores will be RRR stores." Ann, what's the basis of this assertion? Sered, that was done in LL's initial incarnation; It was killed posthaste. Go *way* back on this weblog, or grab Hamlet's book (section: Tax Revolt). Hold on to yer hats, as this may be a revisit of that. If open space regions are being over-used, I completely agree with hard usage limits being imposed on them. This will stop the over-use dead. End of technical problem. Trying to solve a technical problem with a fee increase is stupid. Regarding the assertion that the voids aren't intended for residence - I know that that's the stated policy, but if one gives a moment’s thought to the significant changes made in the void sim rules one has to wonder if that policy was being given a wink and a nod by LL (tm). 1 – Doubling the prim allowance. Since the stated purpose of void sims is beautification and recreational use – in fact according to Jack Linden’s blog post - “For those that don’t know, an Openspace is a type of private island that we made available for light use countryside or ocean.” – what need was there for the additional prim count? Granted it may have been a side effect of updated server software which LL (tm) unwisely pitched as a benefit. I don’t recall seeing a great outcry for larger prim allowances on voids – in fact I think most people, certainly vehicle enthusiasts would have happily accepted a 50% reduction in the prim count in exchange for a doubling of the physical size of the voids to reduce rocky sim crossings. We don't want to park we want drive/sail/fly. 2 – Eliminating the four void sims to one full sim rule. Previously the number of void sims an estate owner could hold was proportional to the number of full sims they held. The current rules have no such limitation. What’s more in the past it was necessary to order voids in lots of four. Under the current rules they can be ordered one at a time. I’ve read of people with a 20 to one ratio, most of which are “rented” out to others. 3 – This to my mind is the biggest point which runs totally contrary to the stated usage policy. Previously a void had to be connected to the full sim or estate with which it was associated. This made perfect sense as it was intended to beautify or provide recreational space to that full sim or estate. Under the current rules a void can exist completely on it’s own with no physical connection to any other part of the grid, much less the sim or estate with which it is associated. A single sim sitting in the middle of nowhere does nothing to beautify the surrounding area, and operating a vehicle on a single sim ranges from dull to maddeningly pointless depending upon the speed of the vehicle. A single sim is suitable for only a few things – homes, businesses, of simply goofing about. Most people aren’t going to invest that much in simply goofing about so that leaves homes and businesses as viable uses for a free standing sim. I know it makes me sound suspicious at best and like a raving nutter at worst, but at this point I have to ask how – when the current system was first being discussed at LL (tm) - none of extremely predictable outcomes ever came up? Take a popular commodity – private sims. Increase their value – double the prim count. Eliminate the built in rules which enforced the stated use policy – remove the four to one and physical proximity requirements and allow them to be purchased singly rather than in lots of four. I'm sorry, but a chimp could predict what would have happened. There Ann goes with a reactionary, unfounded assertation. Really, can you back that up Ann, or are you saying that just to get some attention here? If someone can point me to a sane, technical discussion of what all is going on that would be swell. Because the abuse of OpenSpaces seemed inevitable and the decision to raise prices so abrupt and heavy handed I feel like there's a technical issue that isn't being discussed. Is this all related to the network infrastructure info that just came out? Because as it stands I personally don't fathom how using an OpenSpace as a residential (i.e. mostly deserted) sim in any way constitutes "abuse", compared to say the intensive physics requirements caused by vehicle races. Nor are trees and plants of the sort we have now less intensive than houses. So I have to call BS, they simply decided it was time to make more moeny and came up with a "good" reason for it. If LL believed they had serious competition you'd think sometime in the past 5 years they would have figured out how to build a stable load-balancing server that can host many multiples of empty sims, and prices would have dropped instead of gone up. How many cycles of Moore's Law have we gone through now? But in the meantime I don't expect this to impact the population numbers at all. Come join me in the longtime unwashed unpaying masses! Regarding "misuse" of the voids by the rental market, in some cases people who were perhaps new and/or naive (we all were once, about land, remember? LL makes it very confusing to master) were sold sims which they may have believed were "real" sims, not light-use voids, or they may not have understood the difference. They were told their prim allotment by the estate owner, and began happily building. And as long as they stayed within their prim allotment, they thought everything was going along just fine. And no big bad Linden came along to tell them otherwise. Until now. Much later. Most unfair. This could/should have been handled with a less heavy-handed approach. But that approach is the one I have always witnessed during my 2 years in Second Life®. So why should this be any different? There is such potential for what this world could be. And it will be mismanaged to death by the company that owns it all. I think Prokofy explained the harsh economics of this very well in the comments to this article on the Secondlife Herald (and remember this was written before the OpenSim price changes). Basically Prokofy was arguing that LL makes far more profit selling their new mainland sims like Bay City than they do selling islands. So this OS price rise could be part of a campaign to create more demand for their new developments. *per sim*, what do you do? As much as I disagree with what they are doing - there does appear to be a reason behind it - they are making the alternatives to their new developments less attractive. They did this because it was forcing down sales for islands and other things which are more profitable for SL. Our protests will not make any difference no matter how right we are. LL is doing this to appease people such as Ansche Chung and other land barons who felt as thought the Open Space sims were undercutting and devaluing the land they sell since they couldn't compete. @Faerie--maybe you can crank those numbers, but which is more profitable? Selling 31,000 regions or a thousands of parcels. Selling a region is automatic now for LL. Sellling parcels means dealing with land parcel renters/tier payers etc. And btw, isn't Mainland enough of an incentive not to buy Linden managed land. I bought a parcel on Bay City to check it out--they do zero to grow community--they slumlords. I think you should take that up with Prokofy (as others did). Prok made a strong case for the argument that selling the *new* Nautilus and Bay City mainland regions are far more profitable for LL than selling islands are, whether they are full islands or OpenSpace ones. Prok argues (and this is the first time I have ever agreed with one of her posts) that mainland regions have a far lower maintenance/overhead cost for LL than islands do - especially in terms of needing attention from a Linden to reset or relocate or even roll-back the (island) sim. Mainland residents just don't get (or ask for) that level of Linden attention (according to Prok) so they are cheaper to run and they give a far greater initial cash return. The issue of whether you or I would want to live in one of their new developments is irrelevant to the question of 'What is more profitable for LL?'. The answer seems to be that their new developments in Nautilus and Bay City are far, far more profitable than selling OpenSpace islands. People (landbarons maybe?) *are* paying in excess of $50,000L per 1024m parcel! At those prices isn't it any wonder that LL *might* be trying to up the costs of the cheapest alternative? We need to remind ourselves that LL are a business trying to maximise their profits (not their resident's profits - *theirs*). Everything they do is based on that idea. The case for a plodding and methodical destruction of the competing business of landowners has been made repeatedly ever since LL dropped the price of these OSR's and announced that they would be pumping them out en masse. The best way to determine a companies motives is to examine their behavior and make note of what that behavior actually accomplishes, if you can ignore the rhetoric. People like to call this a conspiracy theory. I would say that you would have to assume an awful lot of accidental providence and a fair amount of downright stupidity on the part of LL in order to ignore the possibility that LL knew what they were doing all along. Keep in mind that long before any of the sweeping changes that have led to this debauchle, the writing was on the wall for the real-estate market in SL. the release of the viewer code and the reverse engineering of the server code virtually ensured, with LL's active participation, that other grids will eventually open up, introducing competition and vastly reducing the value of virtual land. Arguably it's value should be pinned to the cost of resources in current hosting solutions with a similar profit margin - perhaps $100/mo for a full prim region. maybe $40/mo for an OSR. With that as the backdrop and LL's active participation in the opening of that market it would be silly to think they have a long-term strategy for renting private islands versus "value added" mainland (if you could call it value-added, but i dirgress). SO we can assume that they see private islands, and their owners, as a temporary cash-cow that will last as long as they have a monopoly on a virtual economy. So what to do with a cash-cow? Why you milk it, of course! The idea that LL was somehow unaware of the use of OSR's as residential, and even commercial, sims would suggest that they did not notice the many 100's of them that were already being sold as residential well before they made the decision to make them even more attractive. It was, after all, their land store that was advertizing "Low prim Private island paradise with 1875 prims and 64k sqm!" by the many dozens at any given time. And remember, they were delivering these OSR's manually at the time, with names that clearly suggest their usage, and to locations which are clearly not "forest or water". Then you have to keep in mind that concierge has been providing support for these islands since they were first introduced. Providing rollbacks to restore a residents lost poseballs, etc. To suggest they didnt see it happening is rediculous. So lets assume the obvious, they knew full well how they were being used. When they saw it happening they had 2 choices really, smack down the abusers and enforce their guidelines, or jump on the gravy train and ride it. Doubling the prim count, freeing them from estate boundaries, allowing landowners to buy them one at a time and drop them in isolated locations on the grid, I think these decisions illustrate fairly well which way they decided to go. The changes were designed to accomplish one thing, there is in fact only one reason to make these changes in tandem, to make the OSR's more atttractive for residential use, increasing demand for them. Having done that they were suddenly inundated with manual orders for them for many weeks. For awhile the demand was so large it took 21 days to deliver them. They sold and delivered hundreds per day, and this was at the original high price of $415 for setup, for many weeks, until the demand finally dropped off. Meanwhile they were already working on the new land store which would automate the delivery of OSR's. Is it reasonable under any stretch of the imagination to think that they did not already have a plan to lower the price and create a new demand as soon as the store was ready? This is where the bait and switch argument comes in. Having exhausted demand at the higher price they made the announcement to lower the setup fees for both the full prim sims and the OSR's, inviting 1000s of residents jump into an already overcrowded land market and become "landbarons" in their own right. Its was easy, and now it was cheap, many people were salivating at the thought, others were complaining that they couldnt afford the full prim sims required, and they wanted their own OSR too. Others were decrying the abrupt devaluation of current holdings, myself included. A few of us were predicting the end of the real-estate market and beginning to realize that LL was acting with malice aforethought. It wasnt a popular theory at the time. Notably, LL was completely silent after the initial announcement, pretending not to see these issues being raised at all. They started the announcement with the disclaimer of light-use and let the feeding frenzy build without a single comment... No responses like, dont buy these if you want to live on them to all the salivating posts, just silence. My point about their silence? It was out of character for a company so concerned with improving the experience for their residents to ignore so many questions which should have raised concerns about what the users expectations were. Just as it is now for them to remain silent in the face of the reaction to their price hike for so long. I believe they did not want to contradict their use guidelines and make themselves culpable, but also did not want to do anything to qwell the demand. But thats pure conjecture, I admit. They ignored the warnings of many of us about performance and the effect on the economy. They ignored the questions which directly demonstrated that most of the demand was for residential use. My personal pet peeve at the time was that they continued to sell the full prim islands at the high price of $1675 on the land store, with no notice being given of the pending price change, all the while discussing and price drop and postponing it until the new land store was ready. This was also around the time they started the trend toward posting blogs with comments turned off and moved the grid status announcements to their own page, some of our comments were very off color, and increasingly off topic as they would not raise a proper forum to discuss private island issues. I accused them of practicing a bait and switch land scam and setting an example for those who would game the system (landbots etc). So the new land store was finally released to great effect. OSR On Demand was a resounding success. The land glut was a perfectly acceptable tradeoff for low mainland parcel sales as long as the orders were rolling in by the 100s per day. Meanwhile LL had turned its focus to the mainland cleanup project, rolling out new regions, outlawing advertizing parcels, creating new roads, adding "value added communities" like Bay city and Nautilus... why all the sudden reverse their long standing practice of ignoring all this? Well, we have already established that the Private Island market will only be temporary, so in order to consilidate their user base they are going to have to entice them back to mainland so that they wont jump to other grids when the doors swing wide. And if you are the suspicious sort, perhaps they had an inkling that eventually they were going to have to do something about the land glut they had engineered, but not until it had played itself out. As will happen when you sell something with no controls on quantity the supply quickly outstrips the demand, suddenly no one could find a tenant for anything. There were nearly as many islands as concurrent users, and the land market was essentially crashed. Of course, this means that instead of buying OSRs through the land store people started selling them at loss in the forums. Sales had dried up, and with it, LLs unsustainable growth spurt. But LL is all about growth - so how can they possibly re-invigorate the market when they cant add users and cant sell land? Welcome to the new solution. Raise the price of OSR's beyond the ability of anyone but the worst abusers of them to afford to keep them. Everyone else will be forced to either abandon their OSRs or spend more fees converting them back to full prim regions. The tenants suddenly made homeless by the dumping of OSRs will decide that perhaps its best, after all, to head back to the mainland, since its been cleaned up an bit. The reduction in OSRs will open up computer resources for more mainland to meet that demand, and reduce the load on the infrastructure casued by haivng a region for every 2 avatars online at any given time. All's well that ends well - With one drastic shock to the system they have solved all their problems; infrastrucure load is reduced, Land supply shrinks, Revenues grow. All they had to do was decimate a few thousand landowners, and if you think they didnt see it coming, even allow for the probability that it was an evolving plan, then maybe you deserve what you get. But no one deserves to be treated like a mark just because they are foolish enough to believe the rhetoric. As I said at the outset the best way to gauge a companies motives is to examine the effects of what they do. This is not about the users, Its not about abuse, Its about growth and customer retention. These would be laudible motives if they weren't fleecing the residents to fund it, changing their pricing every few months before anyone can recover from the last change. Raking in the fees and teris. LL has taken its operating philosphy from the likes of enron, bush & countrywide.